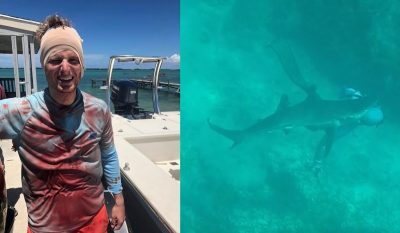 In a harrowing GoPro video you’ll definitely want to omit from your memory bank next time you dive in the water, a spearfisherman was bitten by a shark leaving him with gashes on the back of his head and a blood soaked shirt. 3 months ago, Will Krause, 29, was spearfishing off the Abacos Islands in the Bahamas when he had a terrifying encounter with a reef shark. His friend, Zach Shipps, was capturing some spearfishing footage with his GoPro, when the shark swam right past him with its sights set on Krause. The shark closed in on Will’s backside and struck him in the head/neck. It’s plausible the shark may have confused Krause for another shark and was attempting to establish dominance by biting his head. The shark appeared to instantly recognize its mistake and swam off, but had already inflicted a considerable amount of damage. According to Tracking Sharks, the Massachusetts native was transferred by air ambulance to a hospital in Fort Lauderdale for treatment. The post Video: Shark Bites Diver’s Head in Harrowing GoPro Video appeared first on OutdoorHub.